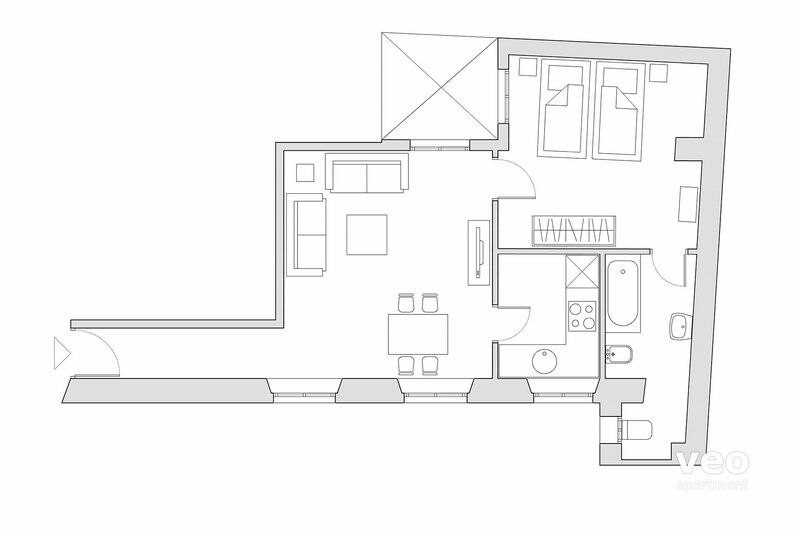 One-bedroom apartment for 2+2 guests. It is centrally located on calle Aponte, near El Corte Inglés, and just 10 minutes walk from the Cathedral. The living room is furnished with 2 sofas, coffee table and TV. There is a table for dining and chairs. The kitchen, with separate entrance, is well equipped with utensils and appliances for self-catering, including oven, washing machine, fridge, microwave and stove. The bedroom has 2 single beds (90x190 cm). Same single beds can be joined by a large mattress topper into one king size bed of 180x190 cm (note pictures show the same bedroom with the 2 single beds separated and joined). If you prefer the large bed, please advise when making the booking. En-suite bathroom with a walk-in shower, w.c., bidet and washbasin. Other features include: high speed fiber optic internet connection, ceiling fans and air-conditioning (cold / hot). Despite being in the centre of the city, it is quiet and peaceful, without exterior noises. Third floor, with elevator. There is a shared roof-top with lines to dry clothes. In the neighborhood, very close walking: supermarket (El Corte Inglés), food market (Plaza de la Encarnación), public parking (Plaza Concordia), restaurants, tapas bars, shops. Note: There are 2 sofa-beds available for 1-2 children, allowing the apartment to sleep up to 4. If you are more than 2 adults, note the bathroom is inside the bedroom. 15:00 - 22:00 Uhr. Aufschlag für Ankünfte nach 22:00 Uhr: 20 EUR (Bezahlung in bar, bei Ankunft). Reduzierte Tarife im Parkhaus "Plaza de la Concordia". Etwa 190 m vom Apartment entfernt. Reservierung per Email notwendig. Babybett: Gratis!. Bitte im Buchungsformular angeben. Flughafentransfer: 30 EUR (1-4 pax). 5 EUR extra für Ankunft in der Nacht, von 22 bis 8 Uhr. Reservierung per Email notwendig. Appartement très agréable, literie confortable, bien situé, au calme. Belle surface, équipement correct. Excellent and quiet modern apartment located in the very centre of the city, comfy bed, strong Wi Fi, big quality bathroom, relaxing sofas, premium tv, new kitchen, will definitely return.